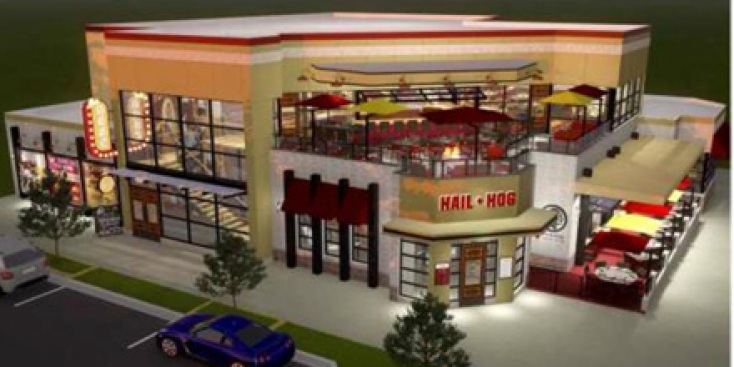 Hail & Hog Kitchen and Tap is set to open at the One Loudoun complex in Ashburn, Virginia near the team's HQ and facilities. A Redskins-themed restaurant will open Friday in Loudoun County. Hail & Hog Kitchen and Tap is set to open at the One Loudoun complex in Ashburn, Virginia near the team's headquarters and facilities. The massive restaurant will span two levels and 12,000 square feet. The first floor is food- and drink-focused, and will also be home to a radio and TV broadcast studio. When not in use, the space can be reserved for private events. The second floor will feature wall-to-wall 4K TVs inside, and a fire pit and rooftop bar outside. Reservations won't be accepted, the restaurant said on its Facebook page, but would-be patrons are welcome to call ahead. The menu has not yet been released, but the restaurant said it will be posted on social media soon. Hail & Hog is the newest NFL-themed restaurants operated by G.R.E.A.T. Grille Group (g3). Other g3 restaurants include the Houston Texans Grille and the Indianapolis Colts Grille. It's worth noting that those other restaurants bear the actual name of their teams. That's not the case for the restaurant celebrating Washington's football franchise; Native American tribes and organizations, as well as the federal Trademark Trial and Appeal Board, have claimed the Redskins' name is derogatory. Instead, this restaurant's name nods to the team's fight song and the nickname given to the offensive line during the winning seasons of the 1980s and 1990s. "We are excited to partner with g3 to create a first-class venue where Redskins fans can come together with friends and family and celebrate the team's history," Redskins Executive Vice President Terry Bateman said in a release earlier this year. Hail & Hog will be available to rent for private events. The Redskins say they will host a variety of events, including some press conferences, there too.